The introduction from the publisher states that you won’t want to put this book down until you finish it. I thought to myself, sure that is what they all say. True statement! I did not put this book down until I was done, it was THAT good! Love at first glance at the Title honestly. Described as a Proper Romance, what a superb new genre! 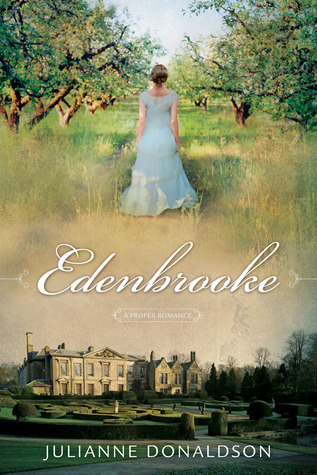 Reading “Edenbrooke” just brought thoughts of a beautiful castle in the country with wondrous gardens and lovely lords and ladies around. Well the title conjured up quite accurate descriptions once I got reading! Upon their Mother’s death, Marianne Daventry and twin sister Cecily are sent by their Father to separate homes to mourn as he takes off on a trip to mourn alone. Marianne is sent to live with her Grandmother in the city of Bath, while Cecily is sent to live with her Mother’s best friend Caroline Wyndham, in Kent. Marianne is drowning in city life while she long to run and twirl in the country air. Grandmother is crotchety to say the least and now wants to have Marianne learn to behave like a Lady. Marianne is invited to visit the Wyndhams at their country estate and meet once again with her sister, which Grandmother feels will be a perfect opportunity for Marianne to learn the lady like ways. Such beautiful descriptions of the estate and the grounds of Edenbrooke I could envision being there! The heroine Marianne is such a free spirited young lady who just wants to sit in the gardens and paint and twirl around under big trees with her hands in the air. Missing her father so much and the country it is so nice to see her going off to the Wyndhams estate. And Lady Caroline has a single son, too bad her sister Cecily plans on marrying him. Get the idea?? Super sweet romance. Loved every minute of it! One of the best romance novels I have read in a long time. Just pure, sweet love!! Fantastic job to Julianne Donaldson on her debut novel! I look forward to reading many more Proper Romances from her. I received an ARC (Advanced Readers Copy) from the publisher in exchange for an honest review. I have an ARC to give to one of my readers as well. You do NOT want to miss reading this book!! Thanks for the review and for the chance to win! I guess if I had to pick one, I'd say I'm a city gal, mostly because I enjoy much of what society has to offer. One of my favorite places to visit is New York City. That being said, I love the country and feel so peaceful when I'm there. I think I'd love to live in the country, within short driving distance of the city! This is one of my favorite reviews on this book so far. They all have been raves but yours really has me excited. If I have to pick, I'd be a city girl. The country has it's charms but for me, it's better suited for a weekend getaway. I'm hoping your giveaway extends to Canada. I'd love to read this one. I'm a city girl with a country heart. I've lived in the city but am looking forward to moving to the country soon. I'm more of a country girl but have been in the city sooo long. Thanks for the chance! Sounds wonderful! Please count me in yhanks! Though I romanticize the idea of being a country girl, if I'm being honest, I'm somewhat more of a city girl. I love art, architecture, historical buildings, and the buzz of the city. I'm a city gal but I wouldn't mind living in the country for a while. With a heroine named Marianne, how could i NOT want to have it? and i am a country girl through and through! Thanks for the great review/post and the opportunity to win! It sounds like a good read and the lead character is a Marianne so I'm all in. I'm a city gal myself. Sometimes I think I'd like the country, but then I remember going to my grandparent's farm in Missouri during the summer and being so bored. Much better here in Philly area. I'm much more of a country girl, but enjoy going to the city once in awhile. I REALLY want to read this book! I just saw it in a catalog and can't wait to get my hands on a copy, winning this ARC would be fabulous! I am a country girl that likes to visit the city from time to time. Thanks for the fabulous review! I'm so glad you enjoyed Edenbrooke!